What is the Nature Bowl? Nature Bowl is an annual science based educational program for 3rd – 6th graders that increases ecological knowledge and conservation literacy. In team settings, students eagerly learn about the environment while building teamwork skills and sharpening their creative and critical thinking abilities. The program curriculum corresponds with California’s “Next Generation” Science Standards, which makes it a popular event for teachers and educators. Nature Bowl, currently in its 30th year, is coordinated by the California Department of Fish and Wildlife and partner organizations. How Does Nature Bowl Work? During Nature Bowl, teams of Sacramento Valley and Northern/Central Sierra Nevada elementary students in grades 3-6 work together in science and nature-based activities. Each team consists of a coach and 3 to 9 children who participate in one of two divisions. One division is for 3rd/4th grades; the other division is for 5th/6th grades. Teams register for a specific semi-final site where they will compete with other teams. Two teams from each semi-final site will advance to the finals. Although Nature Bowl is competitive in format, the competitive aspect of the program is de-emphasized so all students feel comfortable and achieve success in learning. Any youth group can form a team. 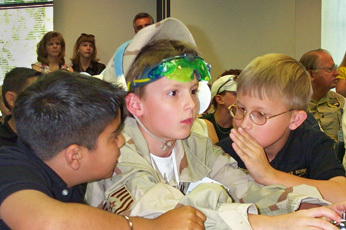 This includes school groups, clubs, scout troops, homeschoolers or any other organized group. Coaches can be teachers, parents, club leaders, student teachers or any other adult who wants to mentor a team. Schools can send only one team to each division.